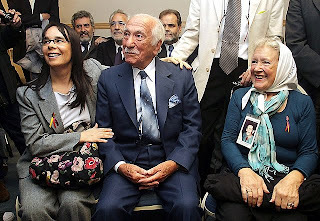 Survivors of persons who perished during dictatorship are pressing Argentinian judges to investigate allegations of international offenses in Spain. Their suit marks the 1st request in Latin America for "the exercise of the principle of universal jurisdiction" over "genocide and/or crimes against humanity." (Page 2 of complaint in Spanish, available in pdf here.) It asks for an investigation extending from 1936 to 1977 -- the entire era in which General Francisco Franco (prior posts) ruled Spain, an era during which tens of thousands were killed. 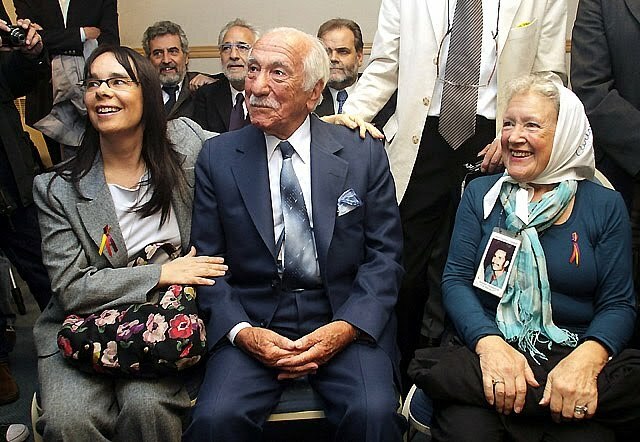 Spain, of course, has been the locus for criminal proceedings against perpetrators of torture and other crimes committed under military rule in Argentina and Chile. This suit thus turns tables. It also affords support for the Spanish judge who initiated the investigations related to Latin America, Baltasar Garzón (left). He's been under attack in his own country: he himself is under criminal indictment for his decision to investigate crimes of the Franco era in spite of a national amnesty issued in 1977. Efforts to continue to shield alleged perpetrators in Spain seem likely to add strength to the Argentine complainants' argument that their own national courts must enforce accountability.